Spend the first day of your Switzerland trip in the famous swiss skiing village Zermatt at the foot of the Matterhorn where you will also stay overnight. Board the popular Gornergrat Bahn, europes highest open- air cogwheel train, which will take you up to the Gornergrat at 9339 metres high. Continue onwards on the next day with the famous Glacier Express Train and enjoy one of the most raved over rail journeys in the world. 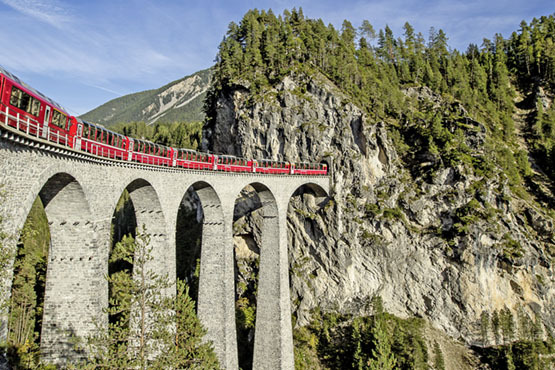 The Glacier Express travels through the picturesque swiss alps in an 8-hour journey to St. Moritz. Upon your arrival in St. Moritz you will have a full day at leisure to spend in the exclusive mountain village. 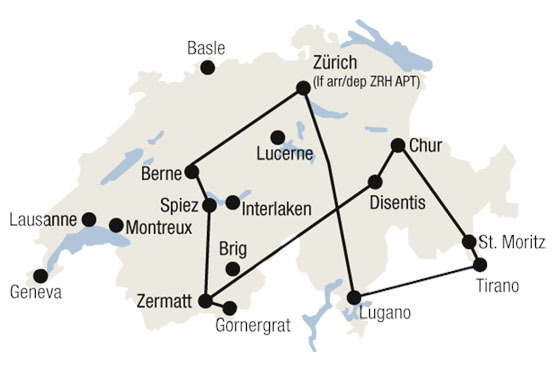 On the 5th day you will board the Bernina Express and travel along the famous UNESCO World Heritage route. Enjoy an alpine adventure taking you from a landscape of towering glaciers to one of swaying palm trees, where you will spend the last night on your trip in the Italian part of Switzerland, in the city Lugano. From Zermatt, the popular Gornergrat Bahn, Europe’s highest open-air cogwheel railway, takes you up to the Gornergrat 9339 m away. The train crosses impressive bridges, galleries and tunnels. On the Gornergrat viewing platform you are surrounded by 29 peaks rising to above 4000 m. Overnight in Zermatt. Day at leisure in St. Moritz. Chic, elegant and exclusive with a cosmopolitan ambiance, it is located at 1,856 metres above sea level in the middle of the Upper Engadin lake landscape. The dry, sparkling «champagne climate» is legendary and the celebrated St. Moritz sun shines for an average of 322 days a year. Overnight in St. Moritz.